The text of motions passed regarding this item have been added at the end of the update below. The debate on the motion asking for a report on a pilot project for a $1 off peak seniors’ fare went on at great length at the April 29 TTC board meeting and provided some political theatre along the way. Should seniors as a class of riders receive discounted fares, and how generous should this discount be? Are other groups of riders equally or more deserving of discounts? Should a “pool”of subsidy related to discounts be allocated to various groups based on needs, or should the scope of such subsidies be increased? How will eligibility for any subsidy be administered? How should any fare subsidies be funded, and what is their priority relative to other transit needs such as improved service and maintenance? Should the standard fare structure be revised to provide benefits to all riders rather than targeted groups? The proposal for a $1 off peak seniors’ fare came from Commissioner Vince Crisanti, a member of the Ford faction in the previous administration who was not noted for his generosity on the subject of social programs. Moreover, when he did sit on the TTC board (before the coup d’état that ousted many of the Ford crew), his knowledge of transit matters could not be described as encyclopaedic. To be fair, at this point the proposal was only a report request – tell me whether it would be feasible to have a pilot program to test the lower fare – and one might expect the whole thing to disappear if the result proved impractical, especially from a financial standpoint. The problem, of course, is that everyone wants cheaper fares for one or more deserving groups, or even for all riders as Mayoral candidate Tory advocated, without getting into the questions of whether this is the best use of transit dollars or how a net new subsidy would fit into the allegedly tight city budget situation. Public deputations on the issue, of which there were few despite the large crowd of seniors in the audience who arrived as a group, concentrated on support for the lower fare. In one case, the presentation by TTCRiders ran into a basic problem that their primary desire is to help low-income riders, but they have been pulled into the $1 fare issue as a jumping off point for their larger cause. Questions from board members were generally civil, although there was a common thread of “how should we pay for this”. One deputant tartly replied that if the city can afford to eat the sunk costs of cancelled LRT projects and build the Scarborough Subway Extension, then availability of revenue is not the issue. Toronto Councillors love to pretend that any discussion of new services or expenditures must be a zero-sum game with higher costs in one area balanced by reductions in others. This ignores the considerable taxing powers of the City that go unused thanks to pandering to motorists (the vehicle registration tax) and to the no-new-taxes philosophy that hobbles modern political debate. The best moment came in a testy exchange between an old Chinese lady, speaking through an interpreter, who was harangued by Commissioner Denzil Minnan-Wong with a series of questions ending up with, to paraphrase, how can we pay for fuel if we let people ride for free? After a short pause, the reply came back: “that’s a stupid question”. For far too long DMW and others have grandstanded at the expense of citizens who just want to exercise their right to speak on public issues, and chairs of meetings (including the TTC’s Chair Josh Colle) have failed to rein in such abuse. That one response burst DMW’s balloon, and will long be remembered. Colle himself noted that he had come to the TTC a few years ago with a similar incentive – helping seniors with lower fares – but has since learned that as a group, seniors are rather well off. The real issue is to identify those who are in need regardless of their age. Commissioner Alan Heisey proposed a motion asking for a report on a variety of fare options to come forward in October 2015 as input to the 2016 budget process. This would allow TTC staff to explore a range of new or revised fares, and in particular whether technical capabilities or limitations of the Presto fare card would affect the implementation. The decision on future subsidy levels will be up to Toronto Council, but the TTC board should already have taken a position on the matter rather than simply inheriting a campaign promise as they did with the free rides for children in the 2015 budget. Voting on the items took a bit of diplomacy as nobody wanted to actually vote against Vince Crisanti’s proposal. In the end, it was amended to request a “briefing note” by June, and then Heisey’s much broader motion was passed. A briefing note does not come back to the TTC agenda and simply updates members on information from staff. A report becomes the subject of future debate. To no great surprise, Ontario’s budget for 2015 included a lot of transit spending, although the degree to which this is new money rather than old repackaged announcements is a tad vague. The transportation portion of the budget, “Moving Ontario Forward”, begins on page 42 of the main budget document (which is page 74 of the linked pdf). The financial information can be confusing because projects are grouped in various sections depending on their source of funding. 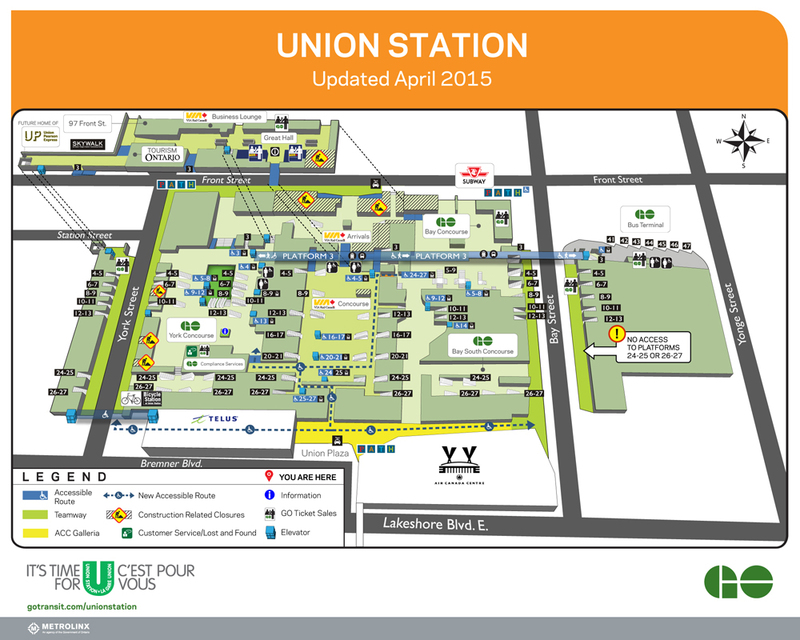 Finch and Sheppard LRT projects. Region of Waterloo’s ION LRT/BRT rapid transit project. A further $25.8b (unchanged from the 2014 budget, see list on pp. 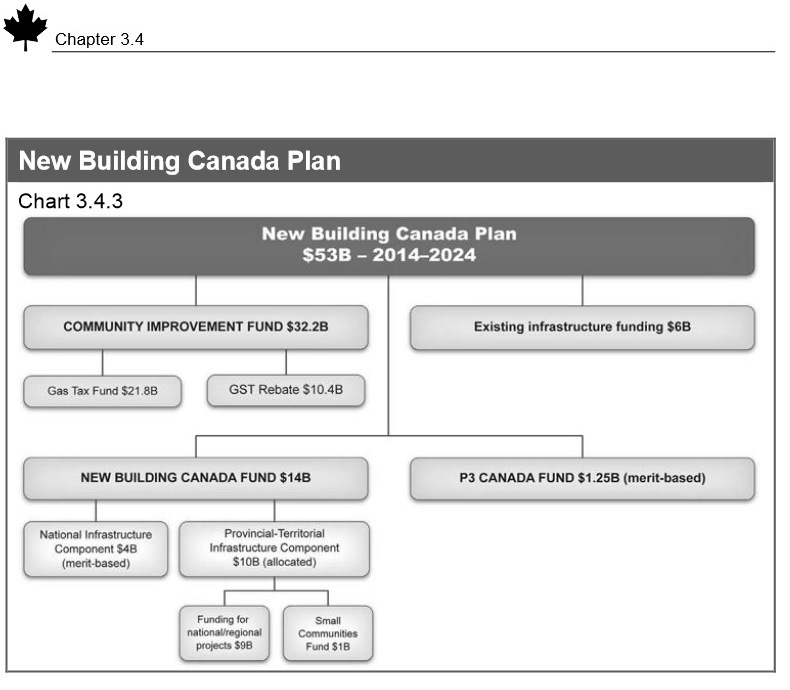 44-45) comes partly from tax revenues that are explicitly directed to the Moving Ontario Forward program. Some of this money is not yet in hand, notably contributions expected from the Federal Government. Given that the UPX will itself operate on a 15-minute headway, I hope that this description is merely a drafting error that has conflated two separate services in one corridor. The Budget goes on to say that beginning in 2015-16, trains will be added on all corridors during various periods. This is an operating cost, not (in the main) a capital cost, and it is unclear whether this is coming from the “Moving Ontario Forward” pot or from general budgetary allocations to Metrolinx/GO. The budget is quite clear that Ontario is not going to build every project solely with provincial money. At this point, Queen’s Park is not getting into a technology debate about the Eglinton West branch of SmartTrack and still describes this line as an airport service. However, as we will see later, the “Eglinton Extension” has been hived off as a separate budget item, and it is to be entirely funded with “partnership” money. Another role for “partnership” funds lies in improvements to the Richmond Hill corridor with flood mitigation. It appears that Queen’s Park regards this as part of the larger bundle of projects that relate to core area capacity relief that should have money from more than one government. Whether Ontario would contribute anything is uncertain, and probably the subject of a future budget announcement if others come to the table. Exactly what “rapid transit in Hamilton” might be is not specified. The status of various projects is summarized in the following chart (p.52). As noted above, the SmartTrack elements of this plan at a cost of $5.2b are left for others to finance, and the Eglinton Extension is shown separately with 100% “new partner” requirements. An obvious place where Mayor Tory might save substantially would be to return to the Eglinton Crosstown LRT option for this segment, but we are unlikely to see any shift in his position until evidence from studies now underway shows just how impractical his SmartTrack scheme is in this regard. Notable by its absence is any reference to Waterfront transit which appears to be left in Toronto’s (or the tripartite Waterfront Toronto’s) hands. There is a generic reference to the proposed works at the mouth of the Don River, but nothing specific. The status of route and technology selections in Scarborough is not touched both because this is a hot potato, and because legitimately Queen’s Park can point to studies now in progress that will sort out the potential role of various lines. Any move away from the subway option will not happen without a shift in Toronto Council’s position, and that is only likely if the project’s cost escalates well beyond the currently projected level. Further enhancements to GO, notably on the Milton and Richmond Hill corridors, are topics for another day. In particular, Richmond Hill is unlikely to get serious attention until Queen’s Park and Metrolinx wrestle with the combined issues of routes serving the core area from the north and which infrastructure improvements make the most sense as a package. 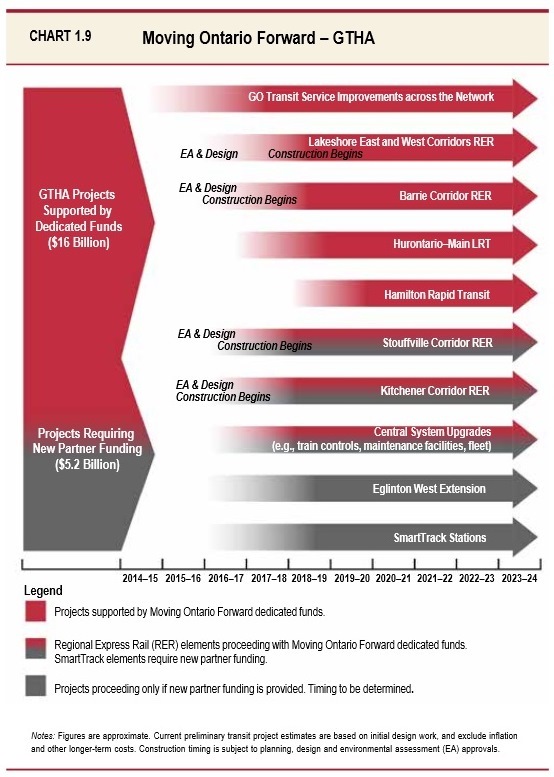 No other Toronto rapid transit schemes are listed including perennial pet projects such as the Sheppard West and Bloor West subway extensions, nor is there any talk of enhancing the ongoing funding via gas tax revenue that contributes, in part, to the operating subsidy. Moreover, the question of funding accessibility is still clearly in Toronto’s hands. The Budget doesn’t give Toronto everything it wants, and puts the City on notice that it has to come up with its own funding to address various problems, even if there might be a bona fide call on Queen’s Park for some areas. At a minimum, there is more definition to what the government claims it will do in coming years. The challenge will be actual delivery, something for which the Liberals at Queen’s Park don’t have a good track record.